Welcome to the Sarasota Restaurant Guide. Find details on all Sarasota restaurants as well as dining in Venice, Osprey, Nokomis and Bradenton. This is also your guide to catering and caterers in Sarasota for your next event. 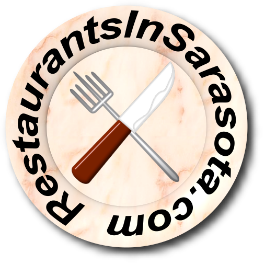 Browse through Bradenton and Sarasota restaurants by name, or use the links below to find restaurants by cuisine or location or narrow your search. Sarasota Restaurant News - News and buzz from around Sarasota's dining scene. New! Below, we just added our Facebook link. Be the first to "Like" this page! Review your favorite (or not so favorite) restaurant. Just look them up in the search and post your review on the page about the restaurant. You'll never go hungry in Sarasota. Traveling around Sarasota you'll find no shortage of great places to eat. From Longboat Key to St. Armands Circle restaurants to Downtown Sarasota and Siesta Key, Sarasota, Bradenton or Venice, Florida, suncoast dining boasts some of the finest restaurants in the world.